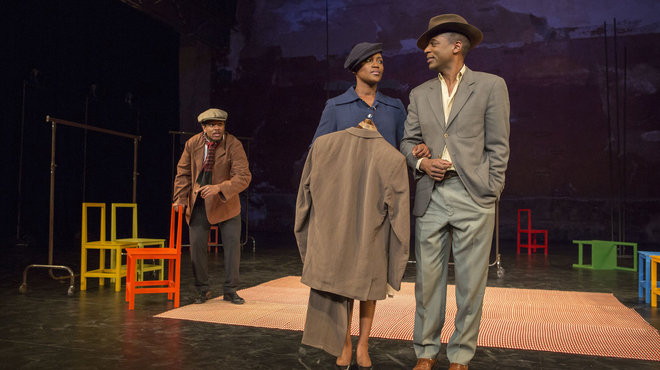 We had Gogol’s The Overcoat and now we have Can Themba, Mothobi Mutloatse and Barney’s Simon’s The Suit, directed by Peter Brook, Marie-Helene Estienne and Franck Krawczyk at BAM. The comparisons are hard to ignore. In the classic Gogol short story a civil servant named Akaky Akakievich has his hard won overcoat stolen. In the current production, The Suit is the iconic object and its fate is personification. Philemon (William Nadylam), a South African lawyer in Sophiatown outside of Johannesberg, can neither forget nor forgive after he learns of his wife Matlida’s (Nonhlanhla Kheswa) infidelity and the suit, left behind in haste, becomes a permanent if unwanted member of the household— Matilda's Scarlet Letter. Philemon also recalls Orpheus since he loses his love when he can’t help looking back--in this case at her deed. The Suit is a chamber musical, a piece of folk theater that relates a parable about lovers who become emblematic figures, their individual fates mirroring the condition of blacks in South Africa during Apartheid. Philemon is content with the existence he leads and yet Matilda is not willing to accept and her tragedy is the fate of the dreamer who's unwilling to accept her present world. The oddity of the play and the current production is the equation of sexual and political liberation. Is Matilda’s punishment tantamount to political repression? Adultery may be the expression of the desire for a better life, but it’s unwieldy when it becomes a symbol for the kind of freedom the play alludes to.